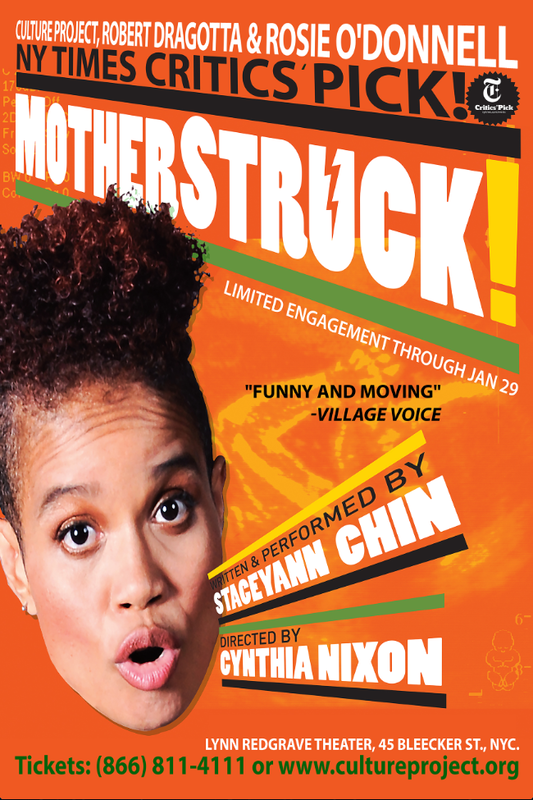 “Motherstruck!”— the astonishing one-woman, biographical theater piece by Staceyann Chin— doesn’t waste any time getting started. From the moment Ms. Chin enters the stage, her impact is like that of a 3-D graphic novel come to life on an IMAX screen. She opens with the childhood recollection of “The day I got my first period…”. Her no-nonsense, old-school auntie responded: “Keep your legs closed and your schoolbooks open. God will take care of the rest!” One of the young Jamaican girl’s earliest fears, unsurprisingly, was that she’d become pregnant. It’s amusing, then, that Ms. Chin’s later desire to become a mother would becoming an all-encompassing personal quest. For a single, out-and-proud lesbian without health insurance, realizing that dream would be a challenge. More specifically, it would be one challenge after another, some of them seemingly insurmountable. Chin’s determination, humor, and intelligence allowed her to face those challenges, and it’s the dynamic stage presence of the performer combined with tight direction by Cynthia Nixon that makes “Motherstruck!”– the animated version of that chapter of Chin’s life– so successful. Stacyeann Chin doesn’t waste a single word or movement throughout “Motherstruck!”, and her delivery hits her mark every time. It’s both comedy and tragedy– sometimes even in the same scene. One of those scenes made me realize that it takes an artist with true talent, stage presence, and an innate wit to make an audience break into laughter in the middle of a quiet, provocative moment. We don’t doubt that Staceyann has a lot more stories about her life to share, and we believe that regardless of any challenges she faces in the future, she will survive. The question is: Are we, the audience, strong enough to handle the emotions she provokes from us? Well, we can’t wait to find out! “Motherstruck!” is now playing at New York City’s Lynn Redgrave Theater, 45 Bleecker St, New York, NY 10012 through January 29th. Visit www.CultureProject.org for tickets and more!